Porch and patio swings are a simple but great way to improve the amount of leisure and comfort you can get out of your home's outdoor living space. They will instantly upgrade your outdoor living area, creating an attractive and cozy environment to be enjoyed by your family and friends anytime of day. Porch and patio swings come in many shapes and forms, and it might be a bit difficult to choose the one that will suit best your home. We have selected here three popular swings bought by Amazon customers. These were either the best rated or the most popular patio canopy swings bought on Amazon, and they come with a range of features and characteristics that should satisfy different tastes. This article will compare Ozark Trail, Mainstays and Best Choice Products patio swings. Selected Porch and Patio Swings on Amazon. Mainstays and Best Choice products: The three cushions are double cushions: a top one for your back to lean on and a bottom one to sit on. Both top & bottom cushions have Velcro strips that attach the cushions to the chair. Mainstays and Best Choice Products: Polyester upholstery is supposed to resists fading and discoloration and is easy to maintain. But note that it is not water resistant, and it can get discolored over time if not protected. It is definitely recommended to cover these swings when it rains. Ozark Trail: Woven fabric made of durable polypropylene-covered polyester makes it strong and resistant to staining, sunlight and mildew. Ozark Trail swing features a center console and pivoting table for holding your phone, beverage, magazines, etc. Note that powder coated steel resists rust. Mainstays and Best Choice Products: Though the product descriptions may say the cushions are weather-resistant resistant, they do get wet when it rains, and they could get discolored over time if not protected. A cover should be used to protect in bad weather. Ozark Trail: The two-seat swing and canopy are made of a ventilated woven pattern that is cool, fade-resistant and comfortable. The hammock position is the position where the swing becomes flat like a bed. Mainstays: It does not swing in the hammock position as it is locked by the bar supporting the bed. However, it is possible to fold up the support leg, and the entire bed will swing. 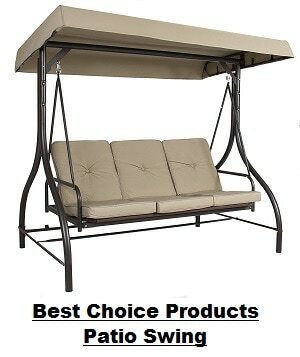 Best Choice Products: it can swing in the hammock position. Warning: When swinging in the hammock position, be careful not to roll off the bed! All three swings come with everything you need to assemble. So which of the three patio swings should you buy? Mainstays and Best Choice Products swings are quite similar in terms of style and design, but note that Mainstays swing gives you slightly more sitting depth. Also, Mainstays has received a better average rating from Amazon customers (4 stars as opposed to 3.5 stars for Best Choice Products swing). The main complaint of Best Choice Products swing buyers is that the canopy attachments are made of plastic and wear off with time. On the other hand, the Ozark Trail swing is quite different, as it is a two people swing that is equipped with a storage table in the middle of the swing. This makes it quite convenient for bringing your drink or a snack along to the swing and for storing your smartphone, book, glasses, etc. So, if you don't really need a three people swing, and if you don't need to convert your swing into the hammock (flat) position, you might want to consider the Ozark Trail swing. Note also that Ozark Trail swing is labeled as for tall and big people. So, if you are larger than average, you might want to consider this swing. 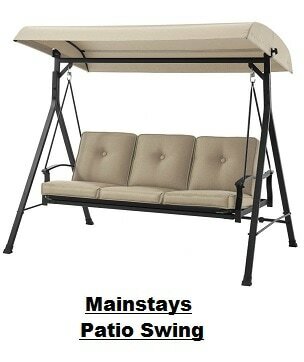 Please click the patio swing of your choice below for price information or to purchase. Note: If no price is shown on some of the Amazon link images below, the prices will be provided once you click the links. Modern design, heavy duty powder coated metal frame. Includes 2" foam filled PVC coated polyester cushion with built-in pillow for extra comfort. 46" built-in canopy to protect you from the hot sun. Overall dimensions: 73"(L) × 46"(W) × 78"(H). Color: Teal/Green/Orange (color choice will be offered when you click the Amazon product link).